In a large pot, cook and stir the onion and celery in hot oil for about 3 minutes. Add remaining ingredients, bring to a boil, then reduce heat, cover and simmer for about 25 minutes. 39 Comments on "Beet & Cabbage Borscht"
Made this yesterday!! I used your recipe~ I’m away from home and I don’t have my moms recipe with me…a few things I thought were a little different, but oh boy so yummy! We’ve always done bbq spare ribs on the side with this soup and I recall my dad always had to have the wide egg noodles with it…so I boiled my ribs first making a stock for the soup…and I also roasted my beets!!! and I’ll just say again, yummy !! I’m kinda surprised we have some left for lunch today !!!🤗🤗. Thanks again for refreshing recipes stirring memories!! All your recipes are great! I have been searching for a recipe for kapusta (cabbage soup) also. It was a favorite of mine when I was a little girl. Jenny, please help us. Thanks. My mom was Russian, she made hers exactly like you do…with short ribs. And you have to use sour cream…for sure!!!! I’m making it this weekend for my daughters. My mom always made them with spare ribs also ~ she would boil them for the stock ~ make the soup and bbq ribs !! So delicious !!! I sure am p”anning on this in the very near future !! Yum ! iam still referring back to your simple and tasty recipes since I discovered your site 2 years ago.You make it simple.I add a dollop of sour cream in a borscht soup at the end after it is finished. Hi Jenny! Just found your blog via Youtube. Your recipes look delicious! And you look just as pretty and sweet as you did on your TV show all those years ago! Thank you for this generous recipe blog. Does anyone know if the beets are supposed to be raw or cooked ahead of time? Raw is the best and be careful not to boil to long because they can become pink. However, Canned whole beets can be grated up and used…in place of fresh…if that’s all you have…. Jenny – we love Beet Borscht and use a recipe very similar to this one. One thing I do is roast my beets in the oven with skins on in olive oil and kosher salt. When cool skin them and dice. Then I add the cabbage and beets in the final 20 min. of cooking the soup. Thanks so much Jenny. Keep the recipes coming. I’m 72 and have never baked anything from scratch or even made a pie crust. But I tried the crusty bread you cook in a pot with the cover on and I was amazed and so pleased,. Thanks for making recipes that are so simple for old people. You can use a slow cooker and it turns out great. You can also freeze it no problem. 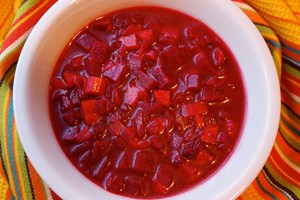 My go to borscht recipe. Hi Jenny, love your recipes. i’m ukrainian and wondererd if you have a reciepe for either BABKA OR PASKA ONE OF THEM CALL FOR SOMETHING LIKE 20 EGG Y0LKS, AND RAISINS. MY GRANDMOTHER PUT ORANGE JUICE IN THE BATTER, OR SAFFRON. BREAD TURNS OUT VERY YELLOW, AND VERY TASTY. I KNOW YOU WILL FROWN ON THE EGG YOLKS, BUT IT,S ONLY AT EASTER TIME. BARB K.
I don’t frown on egg yolks at all but I’m sorry I do not have such a recipe. Barbara Kennedy is talking about a bread, not a cheesecake (sernik). That very yellow-with-yolks, slightly sweet bread with raisins and zest and sometimes saffron, is Easter placek. My Polish Babcia (from Lublin area) made exactly what you are describing. It’s a classic Easter placek, though she made it throughout the year. Jenny sounds so good. Can this be made in the slow cooker. Thank you. I have never used a slow cooker but I can tell you that even with soup, you do not want vegetables that are over-cooked and it seems to me that they would be. But that’s just my best guess so check around to see if other soup recipes use a slow cooker. I make my Borscht in the slow cooker for convenience and it turns out delicious. Also, I do put in beef. I put the beef in for at least an hour so it will start to get tender. Then I add in all the vegetables and seasonings (very similar to yours). I don’t cook the soup all day because I don’t like my veggies mushy and overcooked. It works out well because I can leave it alone and do other things in the house without having to keep checking on a pot on the stove. Also, I sometimes use canned beets if the ones in the market don’t look so great. I don’t see much difference in the soup. We made this and the no knead bread this weekend,outstanding. Anyone try freezing this recipe? Does it work well or everything turn to mush? I have never frozen it for that reason – I think it would turn to mush. Is your preference to serve this hot or cold? I serve it hot with a dollop of sour cream. I just came across your website yesterday and can’t wait to make some of your recipes, including this soup. I have a grocery list and am going to try the oatmeal cake and everyday cookies this week (trying to lose weight but have a sweet tooth all the time). Thanks very much. I can’t wait to see what new recipes you add to your site. Do you use red or green cabbage and do you peel your red potatoes or leave the peel on? OMG look at this! You might just be my favourite food blogger! I just found your blog tonight and you make things like cabbage rolls and borscht. Thanks for being awesome.